A year ago, the St. Helens girls basketball team showed significant improvement — but it still took the Lions six games to win two. This season, the Lions picked up two wins in their first two games. This pleases new coach Michael Fendall. "But I wouldn't say it surprises me," he says. 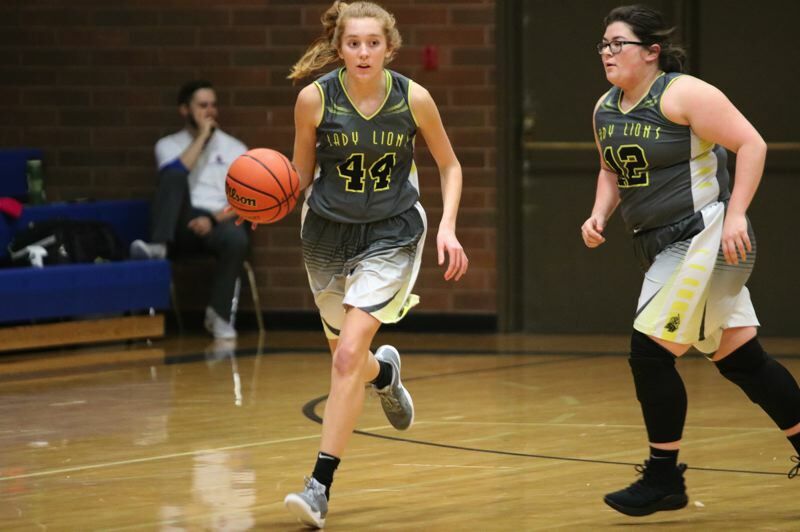 Fendall is new to girls basketball, but he knew when he took the job that the Lions had some talent returning, including "one exceptionally good player" in Maddie Holm. And the team overall, he says, "has been playing with a lot of energy." Two years ago, the Lions started win-loss-win, but that was about all for the good times, as they finished the 2016-17 season with a 3-20 record. The 2017-18 team went 9-16, including 5-9 in the Northwest Oregon Conference, a mark good enough to gain a Class 5A play-in game. This year? Who knows? But the Lions are hoping to make strides, individually and in the quality and depth of their team play. Fendall, who played a 2-guard role with the 2008 Class 6A champion Grant High Generals, has only just begun trying to implement his philosophies on offense and defense. "We're still working in our plays," he says. A lot of things will have to come down the road. For example, "I'd prefer we played man-to-man defense," Fendall says, "but they played zone last year and so for now at least that's what we're going with." Even with limited time to work on the new system, the Lions came out of the gate in good form. St. Helens opened its season with a 58-43 victory at home over Reynolds on Nov. 30, then defeated homecourt Dallas 50-34 on Tuesday. The Lions started particularly well in their Tuesday game at Dallas, building a 28-11 halftime lead. "We pressed, did a lot of trapping, and created a lot of scoring opportunities early," Fendall says. Do-everything junior Holm has been the catalyst, as she was last season. She scored 23 points against Reynolds, then got 11 points against special box-and-one defensive coverage applied by Dallas. Holm wasn't her sharpest in that game; "she missed a lot of good looks that normally she'd make," Fendall says, "but we put her down low on offense to take an extra defender to her in the paint so it could open up shooters outside." The Lions' supporting cast was able to take advantage of the extra attention paid to Holm. Four other players scored seven to 11 points each. That kind of balance "was really good to see," Fendall says, and it was lacking much of last season, when Holm generally had to carry the team, especially on offense. Fendall has been able to rely on fellow starters Madison Blazek (sophomore), Emelia Paullus (senior), Kaela Lee (senior) and McKayla Foster (senior), and get help from reserves such as sophomore Maria Reardon and senior Madisyn Flores. Paullus and Lee have been able to help Holm with ball handling and in bringing the ball up the court. Lee also has been effective on the wing as a catch-and-shoot or catch-and-drive type of player. The Lions have three team captains: Holm returned in that role, and the players' vote for a second captain was so close Fendall decided to go with not just one but two co-captains, Paullus and Lee. Next for the Lions is a nonleague game on Thursday, Dec. 13, at home against 3A De La Salle North Catholic.